It’s time to level up your next pasta night. This chicken and alfredo sauce is FABULOUS. We can’t wait to hear what you think about this easy weeknight dinner! Enjoy! Drizzle the olive oil into the base of the slow cooker, and then add the chicken breasts and sprinkle salt and pepper over the top. Do NOT add pasta or spinach to freezer bag. Put baggie in the freezer and freeze up to 6 months in fridge freezer or 12 months in a deep freezer. Thaw in the fridge overnight, or a warm bowl of water for about 20 minutes. Transfer all of the content from the freezer bag to slow cooker and cook on low for 8 hours. Stir in the fresh spinach at the end of cooking, as directed. 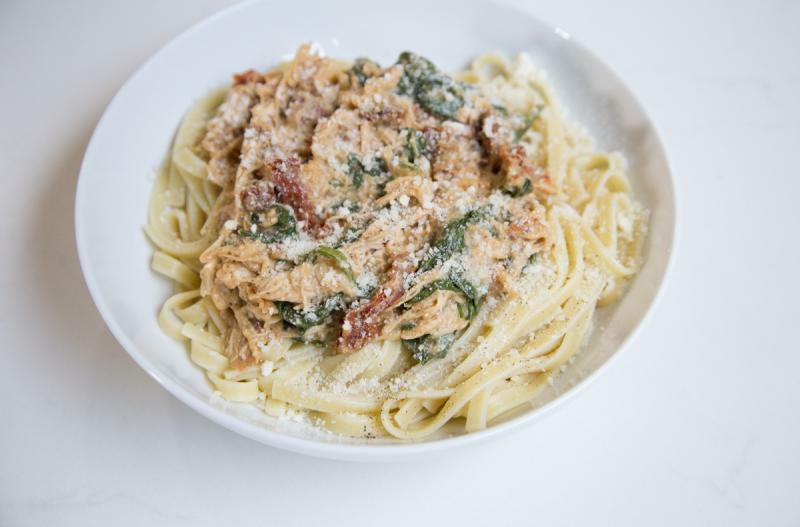 The chicken and alfredo is gluten-free, so serve with gluten-free pasta or side for complete gluten-free meal. Thaw and add to slow cooker and cook on low for 8 hours. Stir in the fresh spinach at the end of cooking, as directed, and let cook another 5 to 10 minutes. Serve with pasta and side salad.